With racing lost on Monday, three races were scheduled for Tuesday, however delay followed delay as the day got hotter and hotter. Finally one race was sailed under a blazing hot sun in very light winds before a further delay and a second race in 10-12 knots. The race course was a minefield of holes and shifts that caught out almost everyone at some stage. After the second race finished at 17.30 the fleet was sent home, after being afloat for more than six hours. With high scores everywhere, several sailors dropped out of the top ten, but it was an opportunity for others to make their move. The fleet was split into gold and silver groups, with the gold fleet starting 10 minutes ahead of the silver on the same windward-leeward course. 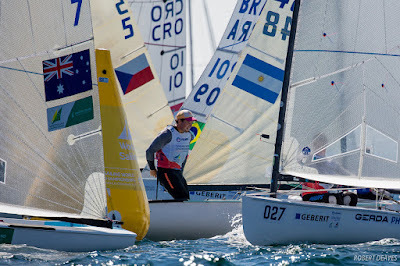 In Gold fleet, Victor Gorostegui was first round the top from André Højen Christiansen and Zsombor Berecz. Johannes Pettersson rounded around seventh and on each leg he passed a few boats before finally passing Gorostegui on the final downwind to take his first ever worlds race win. Gorostegui took second with Berecz in third. The breeze increased slightly for the second race with Oscar flag raised at the start for free pumping. Caleb Paine was first round the top from Wright, but on the second upwind, Andy Maloney found some pace and passed all of them to lead the fleet down the run to the finish with Wright second and Jake Lilley in third. In the silver fleet, Jock Calvert had an amazing day with a 1,2, while Arkadiy Kistanov won the second race. Pettersson, aged 22, was delighted with his first Finn Gold Cup race win. Josh Junior has been lurking all week and has only had three top five finishes, but finds himself climbing from seventh to third overall because he has managed to stay consistent in the inconsistent conditions. Tom Ramshaw also only has three top five finishes, and climbs to second from fourth, but is just one point ahead of Junior. In fact the whole top 10 is very close with just nine points separating fifth to 11th. Considering that today a lot of sailors added 20 or more points to their total, it is not inconceivable that there will be a lot more changes before the final series is concluded. The fleet will now use the second reserve day with two more races scheduled on Wednesday from 12.00 on Golf course area, to decide the medal race line-up on Thursday. There is definitely still a lot of racing left for the 2018 Finn Gold Cup and for the eight spots in Tokyo 2020.